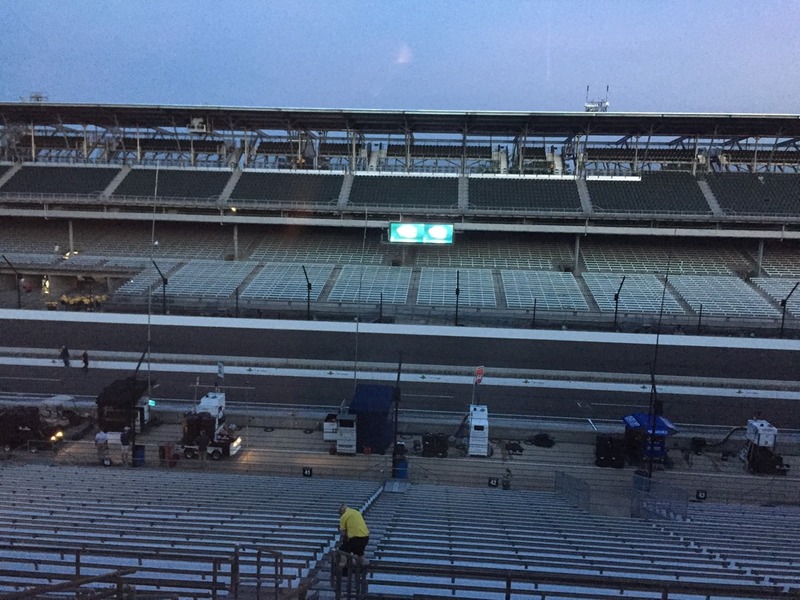 I also made the usual shot of the track from inside the Media Center, although it was not as early as last year’s – accounting for the lighter sky in this year’s photo. 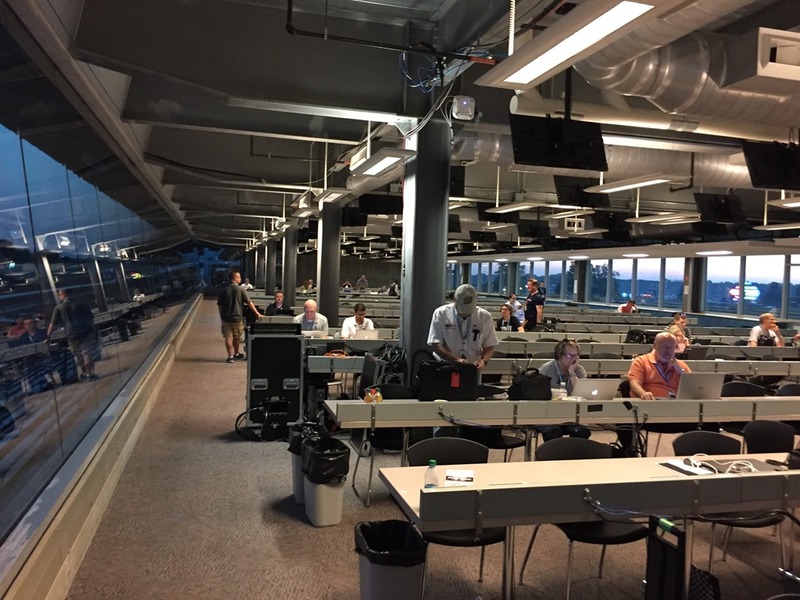 The Media Center was already buzzing at 6:00. By 10:00, there will not be an empty seat. Most days in May, this place is only one-third to one-half full. But on Race Day, it’s packed. There was quite the storm here last night – literally. 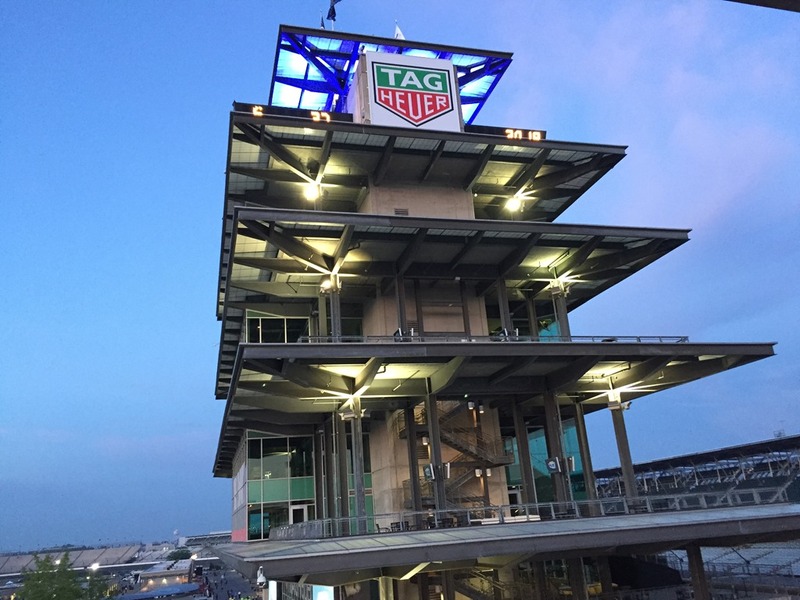 We left the track around 6:00 last night to meet my brother at a restaurant near our hotel in Avon, about ten miles from IMS. A sudden shower popped up out of nowhere while we were eating. While we were in there, we suddenly started seeing random pictures and videos that people were posting from the Legends Day concert at the track. It looked like a hurricane was going through. Apparently the parking lot across 16th Street from the track, where IndyCar headquarters are located flooded and was dubbed by some as Lake IndyCar. I was glad we left when we did. The sun is now fully in the sky and I can hear the Gordon Pipers playing down below. Now that we’re settled, Susan and I are going to go wander the grounds and meet up with my brother. It’s going to be a great day. Please follow us along on Twitter for photos. But please note – there will no tweets during the race for two reasons. One is that I plan on watching the race and not tweeting about it. The other is that with over 300,000 people on the grounds, it’s difficult to tweet or text from the stands during the race. You may follow me at @Oilpressureblog or Susan at @MrsOilpressure. I may or may not have something else up here before the race. Regardless, I’ll definitely have a wrap-up here after the race, so check back later. But in case I don’t come back here beforehand – enjoy the race, everyone! This entry was posted on May 27, 2018 at 5:57 am and is filed under Indianapolis 500. You can follow any responses to this entry through the RSS 2.0 feed. You can leave a response, or trackback from your own site. I don’t think I slept at all last night.